Well I got this award passed on to me and I'm supposed to write something unusual about myself and pass this onto 8 other bloggers. I really must thank Drawing Diva for this award and I think it's funny that she referred to it as a burden! I think it's great but maybe that's because I know I'm an unusual person. Although I really don't see the connection between being a stylish blogger and sharing something unusual about yourself. So here goes...I love science fiction. I saw Star Wars when I was 6 years old and I was hooked from that moment on. My tastes in other genres has broadened significantly as I've gotten older but I still love sci fi! It began with Star Wars, and grew with E.T. I soon discovered Close Encounters of the Third Kind and another oldie Silent Running. No matter how cheesy I have a soft spot for it. And not just movies, I love reading sci fi too. I read the Martian Chronicles, the Dune series and the entire Ender's Game series. I could go on but I'm sure I am boring you and cementing the big loser "L" to my forehead! I'm just a big nerd at heart I guess. I hope I haven't scared off any followers! 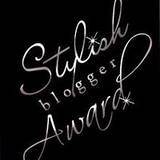 I will be passing this award on to the lucky bloggers below. Thank you! Goodness I'm honoured to be in the company of such amazing blogs! I sound like I'm accepting an oscar don't I? Sadly I won't have to think too hard about weird things about myself. I have a rather long list! I also wasn't sure what the connection between stylish blogger and being unusual. I also like science fiction and am glad you didn't find it a burden. Thanks for showing some fabulous blogs, a lovely way to end my day. thank you so much for the award ... I feel quite happy about it! How funny! I never would have pegged you for a sci-fi fan. :) I used to obsessively read ElfQuest comic books when I was younger. Is that unusual or just plain weird? ha! Thanks for the award.